A quality acoustic piano produces sounds from real strings and real wood, offering dynamics and a tone color that even the best digital piano cannot match. Now, this should be a dream goal for every beginner. You should always count yourself lucky if you get the opportunity to play, and practice on the instrument with such musical responsiveness. An acoustic piano can come in either upright or grand piano. An upright piano has a compact body that fits comfortably in houses making it a convenient choice for a regular person to own one. The pianos strings run vertically, and its keys are reset through a spring mechanism, therefore subjecting it to wear and tear. A grand piano has a more extended body, which has strings and frame that spreads horizontally. Due to its body size, the piano takes a lot more space as compared to an upright one. Its keys are brought back to their resting position by a gravity reset after playing and releasing them. Another factor that distinguishes between the two is the Inharmonicity. This is the degree to which frequencies overtone sounds higher than its primary frequency. Low inharmonicity, therefore, means more accuracy. The grand piano gives less inharmonicity and more vibrant tone due to their longer strings. Upright pianos on the other hands, comes with more inharmonicity due to their shorter strings. This, however, does not mark the upright piano as inferior because several other things are used to determine the sound quality. Digital pianos are designed to feel and sound as much acoustic as possible. It’s designed to produce sound digitally: when a key is pressed, a previously recorded sound from acoustic piano will play in a speaker. 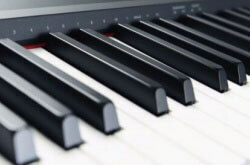 Some digital piano goes even further to having their keys weighted, to provide the right touch resistance, and are sensitive to pressure and speed, therefore, giving a range of dynamics (soft and loud). Note! 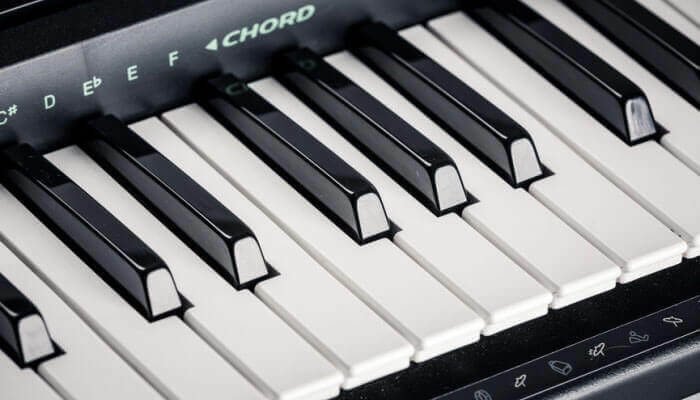 For more information on weighted keyboards, refer to our another article that discusses some of the best digital pianos with weighted keys. The pianos are installed in cabinet-style consoles that are smaller as compared to the upright piano. 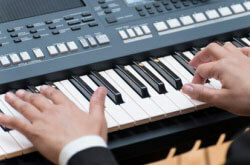 Digital piano can come in three types namely upright, grand and portable pianos. 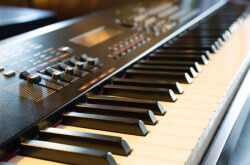 The grand digital piano has a high-quality sound system, and its keys have a better touch as compared to others. The upright piano, commonly used in homes, has a similar size as the acoustic counterpart but weighs less. The portable piano comes with a stand rather than the cabin-style console making it the lightest of the three. It also comes with plastic keys and exterior. So we have an idea of both types and how they function. Now, let’s put them side by side and get a deeper understanding of how they differ in their functions and properties. The acoustic and digital piano has a very different touch and feel. The acoustic pianos keys are weighted, and they require a bit of strength when striking them. 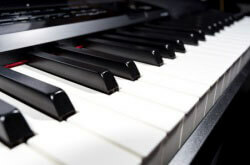 Now, for digital pianos, they can produce a sound even when they are gently pressed. This has led many manufacturers to introduce weighted keys on the pianos to mimic that of an acoustic piano. Acoustic pianos are also very sensitive to touch and can produce different shades of sounds when you use different strength and movement. This is very different to digital pianos, and only finite number of tones can be generated. Many pianists find this as a drawback that limits them to express their music fully. Sound is one of the crucial factors that should be considered when deciding which piano is the best fit for you. As you would have thought, the acoustic piano has the best sound quality that is produced when a hammer strikes the string. It gives you the control of the expression and articulation of the musical notes therefor generating a warmer and a more resonate notes. A digital piano, on the other hand, has a digital file sound that mimics that of the acoustic piano. The piano does not allow the same acoustic nuisance. Even so, a high-end digital piano can have a better sound compared to that of a low-end acoustic piano. 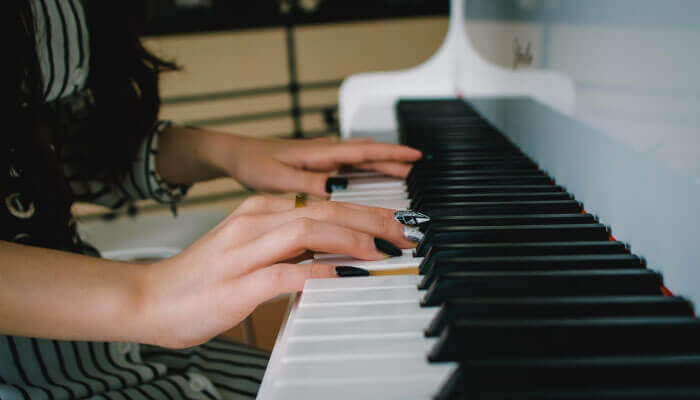 Acoustic pianos need more maintenance as compared to digital pianos, due to their delicate features, such as exterior, hammer felt, and steel strings. With an acoustic piano, you have to be mindful by keeping it in tune and under considerable temperatures and humidity fluctuations. Generally, acoustic pianos are very expensive: a quality acoustic piano ranges somewhere between $4000 – $10000. On the other hand, you can get a quality digital piano with as low as $1000. Their resale value differs, where, an acoustic piano retains a high resale value and the digital piano depreciates much quicker due to many, more advanced models that are released every year. It can, therefore, be a wise idea to invest on the acoustic piano if you want a long-term investment. Even though the digital pianos may lack a lot, regarding sound and other features, they may have a few additional features that make them versatile. Portability – they come in different sizes that are easy to move around as compared to acoustic pianos. This makes them a perfect choice for performances. Volume control – the digital pianos have volume adjustment knob and headphones output. This allows the players to practice without bothering others (best choice if you live with other people or in a room with thin walls). An acoustic piano can also be adjusted based on how long and hard you have pressed the keys. This, however, might not be as effective as that of a digital piano. Recording – most of the digital pianos have a port that can connect it to a computer allowing the playing to be recorded and stored as digital files. Which Piano To Choose Then? The answer to this question is extremely personal and can change from one person to another. To be clear, let’s take the case studies of Jack, a high school student who wants a piano to play his favorite songs to a girl in his school. Jennifer, a lady who lives nearby, wants to take serious piano classes. Steph in her late 20s and Jakes, a retiree who wants to start a new hobby. They are all faced with the same dilemma – digital or acoustic. The perfect choice for each is different even though they are all beginners. A number of reasons will dictate this, and that’s why we came up with simple solutions for our case studies. Taking Jack, for example, he is likely to be on a tight budget and might consider going with a digital piano. There are digital pianos that are available for less than $500 and considering he is a high school student; he needs that in order save up for college. The pianos also have little or no maintenance cost. Therefore, it will save him hundreds of dollars extra cost. Jennifer a mother of 3, works five days a week from 9 to 5. She is serious about learning the piano and hopes to take piano exams after two years and plans to take the piano lessons during the weekends. She also wants her children to learn the piano in the near future. Most of the exams in her area are allowed to be played only on acoustic pianos, and it would be best for her to practice on the acoustic one. She also doesn’t have to worry about disturbing others with excessive noise because she is practicing during weekends. Steph is a busy working adult, and mostly she comes home after 8 pm. She also has a kid who will be asleep by the time she reaches home. Despite her busy schedule, she wants to learn how to play the piano. With all her limitations, Steph needs a digital piano with the headphones and noise adjustment features to play after a busy day without disturbing others. If you are like Steph, you would love to read our digital piano buying guide. There are plenty of different options reviewed in this guide, so you’ll definitely find the right instrument for your needs and budget. Mr. Jakes is retired and willing to invest both time and money in his new hobby. He is also likely to be living alone, or with his spouse, therefore, there is enough space in his home to store an acoustic piano.